MANILA -- For the first time in a public forum, Mike De Leon admitted that it was then-Senator Ferdinand "Bongbong" Marcos Jr.'s bid for the vice presidency that motivated to make another film. And after 18 years in retirement, thus born "Citizen Jake." "I got spooked that Bongbong (Marcos) was running. Well, I knew they (Marcoses) were back but this time, I wanted to do something. Short videos? How can I help? 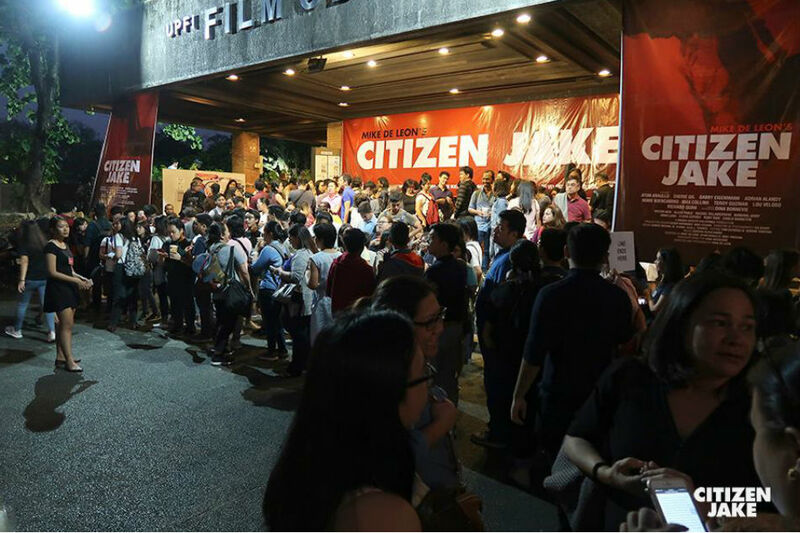 I said finally, OK, it's time to make another movie," he told the audience during what was dubbed the final public screening of "Citizen Jake," at the UP Film Center, last Saturday night. After the release of the mockumentary "Bayaning Third World" in 2000, it was reported that De Leon became a recluse and many thought he'd retire for good. "Yes, I retired from making movies. But as you can see, I can't escape it. Since I was a child, I grew up in the film industry," he said. While Marcos's run in 2016 national elections was the trigger, the initial plan was a family melodrama using De Leon's own family's story. "But not iyakan, it's a family saga. Then the script became two things. And lumalala na 'yung sitwasyon noon. Bongbong was having a big chance na manalo. So I thought it was time to make a switch [in the script]. I have to look for something I think I can handle," De Leon said. Blurring the lines between fact and fiction, those who have seen "Citizen Jake" know there were snippets of the campaign period during the 2016 polls. 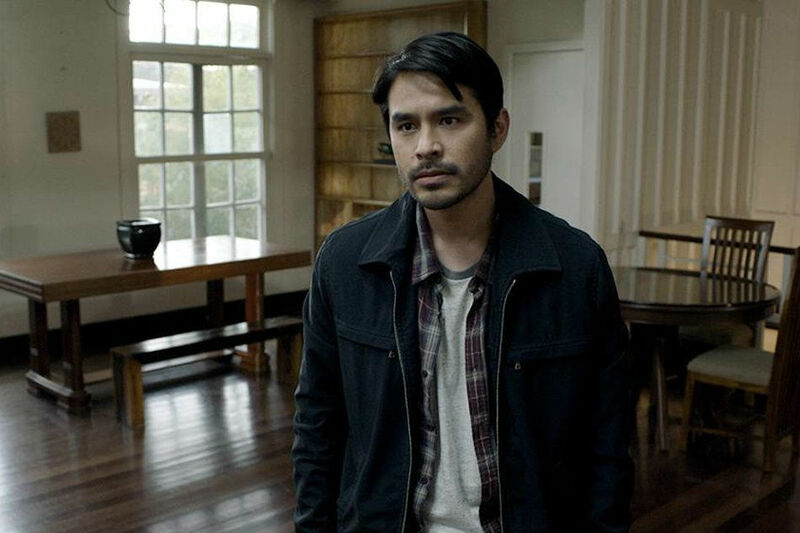 The Marcoses are central figures in the struggles of Jake Herrera Jr., the main protagonist played by then ABS-CBN news reporter Atom Araullo. Jake's father, Senator Jacobo Herrera Sr., magnificently played by Teroy Guzman, is a Marcos loyalist up to the end. Cherie Gil's character, socialite pimp Patricia Medina, is referenced to a real person. Medina is supposedly a movie starlet in the 1970s, who reportedly became one of the lovers of the dictator, pimped by her own film company under duress. In the film, Jake is showing to his girlfriend Mandy (Max Collins) the exact page in "The Conjugal Dictatorship," Primitivo Mijares' tell-all book on the Marcoses, where the starlet appears. The public forum that followed the screenings of "Citizen Jake" and De Leon's new five-minute video "Kangkungan" criticizing the administration of President Rodrigo Duterte, was viewed by cineastes and the filmmaker's fans as his first such participation in decades -- and it could also be his last. 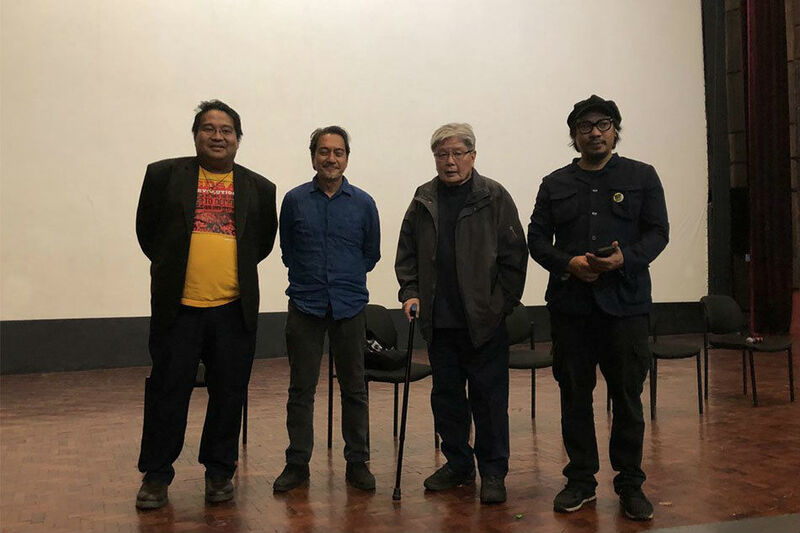 The event was organized by Cinema as Art Movement, Dakila, Active Vista, UP Film Institute, Cinema Artists Philippines, UP Artists' Circle Fraternity and Sorority, UgatLahi Artist Collective and De Leon himself. But what surprised many -- or at least those who knew of De Leon's rare public appearances -- was his willingness to answer questions from the audience, mostly students and older activists. On stage, De Leon sat with other panelists -- history professor Xiao Chua, theater-film-television actor Teroy Guzman and poet-writer-musician-media personality-Dakila president Lourd de Veyra. The forum was moderated by Dakila executive director Micheline Rama. A bespectacled student from UP Diliman asked why the name of Araullo, the lead actor in the film, was only featured and less prominent than Cherie Gil in the movie billing. "That is a movie convention," De Leon explained. "Even if Atom was the lead, had the lead role, it's convention in movies, you give the top billing to the biggest star. And the biggest star is Cherie Gil. That's why Atom was put last but separate." Araullo was not present on Saturday night. De Leon further explained Araullo was chosen because "Citizen Jake" is a form of meta cinema, a method in which the audience is informed that they are just watching a film. "Because he was a journalist, a broadcast journalist in real life who would play a journalist in the film so the distinction between fact and fiction in many instances is blurred. That's why there's also lots of documentary shots like Jonie (Adrian Alandy) the pony boy is shown being pattered after real pony boys at Wright Park. That was the intention. Another was breaking the fourth wall, engaging and talking to the audience," De Leon said. De Veyra explained to the young members of the audience who aren't familiar with De Leon's works that they should check out "Bayaning Third World." There, the filmmakers talk directly to Josephine Bracken and other characters, as if they are being interviewed. Older activists in the audience shared their views on the return of strongman rule and aired their frustrations on what happened, how and why they are back to what was before. Guzman said, "Madaling makalimot ang Pinoy. Yes, ambilis. Ewan ko ba. We just keep on repeating and repeating and it seems to be getting worse and worse. I don't know if the generation coming after us is learning." He emphasized there should be no more fence sitters. "Because there's no gray area. It's either wrong or it's right. It's time to make up your mind." Though De Veyra was member of the panel, the journalist and -- as he termed it -- "school girl in him" prevailed. He couldn't help but ask where De Leon was during the 1986 People Power Revolution. De Leon said he was "all over" with several groups, some with people from the movie industry, though he can't remember other details. But it was clear he participated in the People Power movement until the Marcoses left the country. What he remembered most was on February 25, 1986, he was at the gates of Malacañang Palace with the crowd of protesters. "Gusto nang pumasok ng mga tao and they were very angry. Kung nakapasok 'yun, tepok ang mga Marcoses." Then there were the realizations after the EDSA Revolution. "All of a sudden, we're the talk of the world. Jane Fonda was flashing the Laban sign during the Oscars. (Filipino immigrants) in America were already coining acronyms like TGIF for Thank God I'm a Filipino," De Leon recalled. "Jim Paredes wrote 'Handog ng mga Pilipino' and made an MTV though now, I couldn't listen to it anymore. It makes me cringe now," De Leon added in jest. "I was weary because it was turned into a fiesta. Peaceful revolution was an oxymoron. There was no catharsis. I felt it was a mischance. Nakaalis ang mga Marcoses sa tulong ng mga Amerikano. Kung nakawala sila (Marcoses), they should have been arrested and put to trial. Pero pinabalik pa sa Pilipinas," he said. De Leon believes the EDSA Revolution was a mischance because Cory Aquino could have created a revolutionary government. "She had the power. In fairness to Cory, she didn't want to become president. It was forced upon her. But I can't imagine an Aquino government approving a total land reform," he said and the audience laughed again. "And suddenly, the old oligarchy was back. Balik na naman sa dati." Going back to "Citizen Jake," he admitted that when it was shown, it didn't do well in most cinemas, reasons why he is not planning to show it anymore in movie houses for special screenings. "Theaters like in Trinoma and Powerplant it did well but in other theaters like in Caloocan, it was a flop. Why many stayed away, I don't know. That's the reality of 'Citizen Jake.'" Someone suggested why not tour it in schools nationwide. "Lagi na lamang students. Panahon pa ng 'Maynila sa mga Kuko ng Liwanag,' which by the way I was producer and cinematographer, andun na 'yung mga generic students. And to have them write a reaction paper afterwards. Naaawa na ako sa mga students," De Leon said. More laughter from the audience composed mostly of college students. "Maynila sa mga Kuko ng Liwanag" was a 1975 film directed by future National Artist for Film Lino Brocka. "Let us admit, the apathy was there (for 'Citizen Jake'). So no specific audience like students was targeted," De Leon said with a serious tone. There were questions if he's planning to do a sequel. He said if he could, he would, but there's nothing more to "Citizen Jake." De Leon then thanked the audience for the warm reception of the film in its final public screening. The plan now, he added, is to release "Citizen Jake" via streaming platform. As parting shot, De Leon said if given the chance, he'd revise the line in the film spoken by Jake in a monologue: 'Ito'y isang kwento nang paglalakbay. Kung sa liwanag o dilim, kayo na ang humatol.'" "If I were to make the film again, I'd delete that line or revise that into: Ito'y isang kwento ng paglalakbay. Kung sa liwanag o sa dilim, ang tanga ko naman." De Leon told us later that it was just a joke and in retrospect, he said he wouldn't write that line at all. "With the benefit of hindsight today, Jake wouldn't ask himself that question or I wouldn't write that line. I meant that today, it seems that the journey would only lead to darkness," he said. There was a sense of calm and relief in him as he walked out of the cinema. As he bid goodbye to his publicist and this writer, he said, "Finally, 'Citizen Jake' is finished, forever."